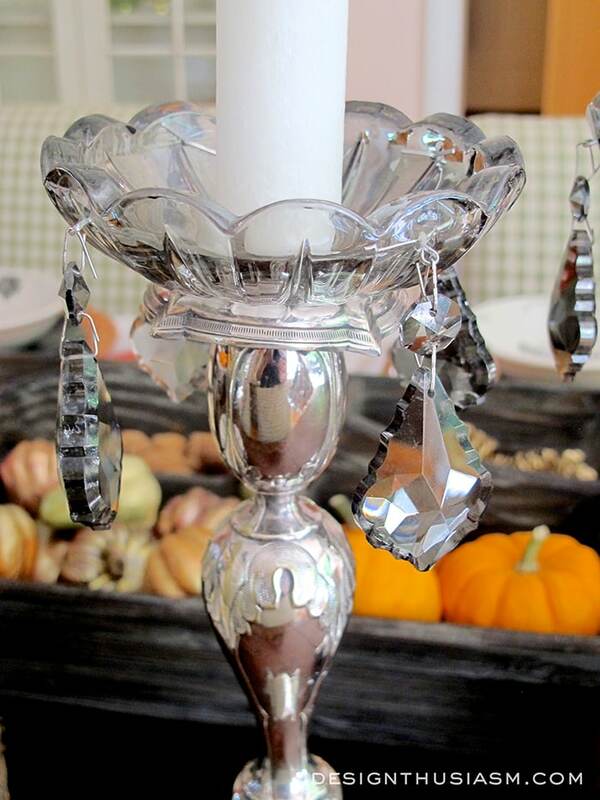 Did you ever feel like you wanted to add a little elegance to Halloween? Imagery for Halloween can be exceedingly kitschy and so often the decor includes oodles of plastic. But for me, decorating for Halloween is based around one concept and there’s no reason it can’t be done while remaining faithful to your design sensibility. The central unifying concept is color. Black and orange is so integral to Halloween, that it almost feels impossible to use it or wear it at any other time of year. For this reason, I’ve approached my decor utilizing color as the identifying Halloween feature, while including traditional French country elements to up the taste level. 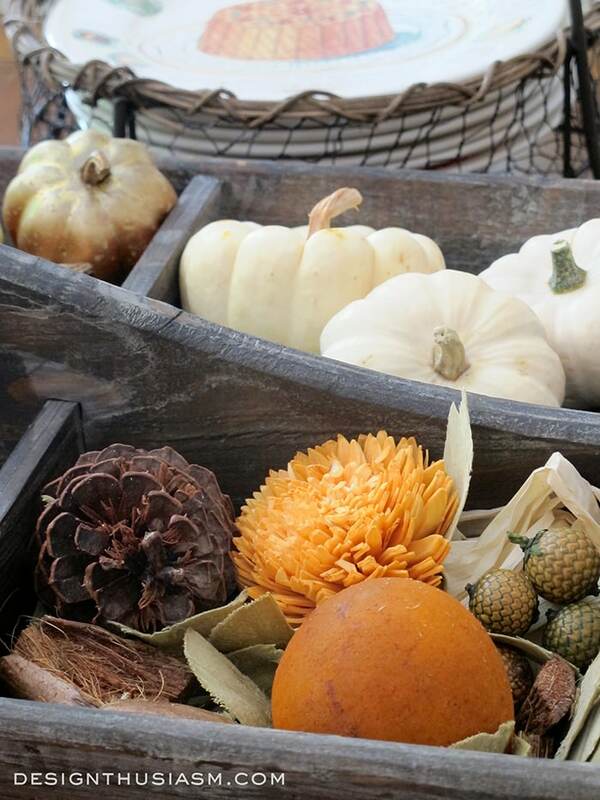 Pumpkins, of course, are essential for any Halloween vignette. 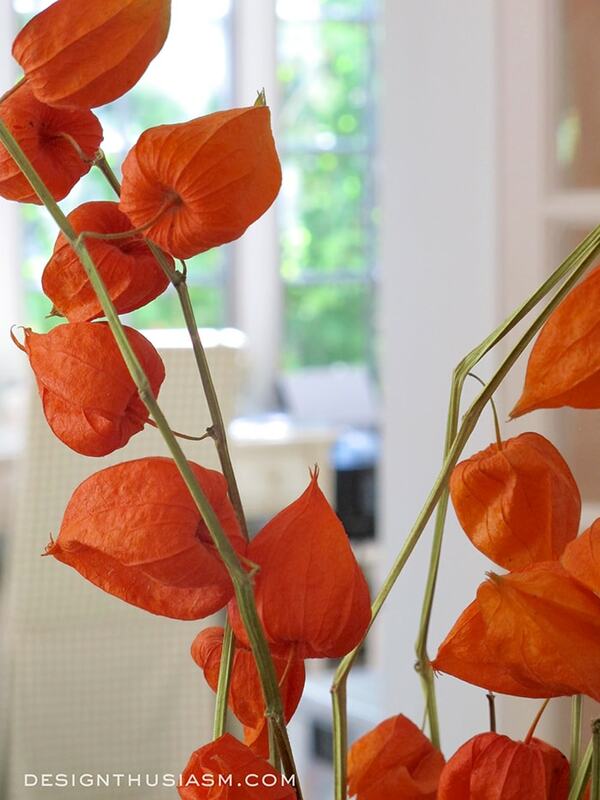 The Chinese lantern plants add a pop of orange and the chalkboard menu offers a touch of black. 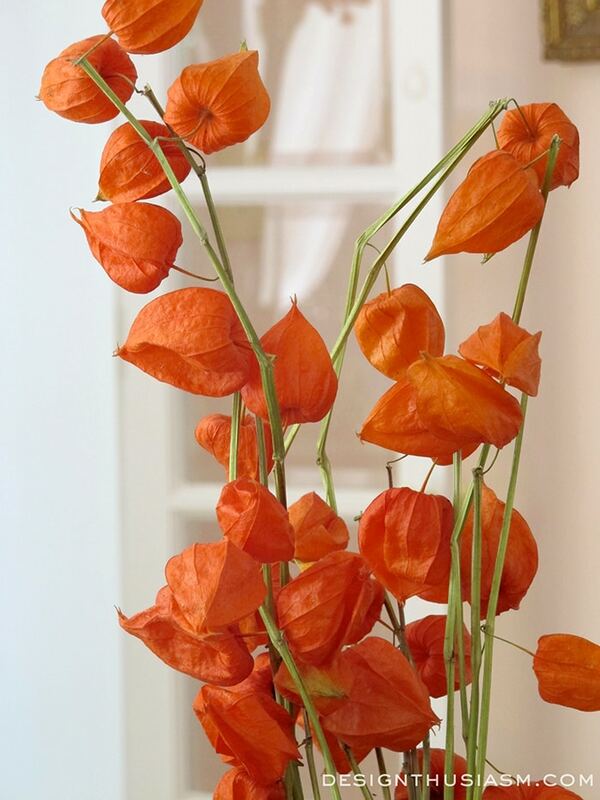 Seasonal potpourri lends spicy fragrance, as well. The plate stack is from Home Goods, topped with French wine label bowls. 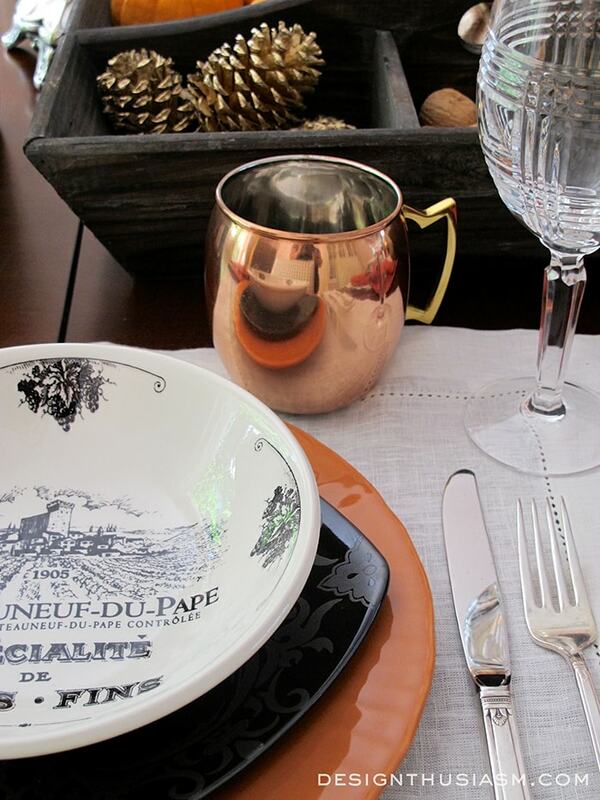 Copper mugs also add a chic touch, while maintaining the color feeling. 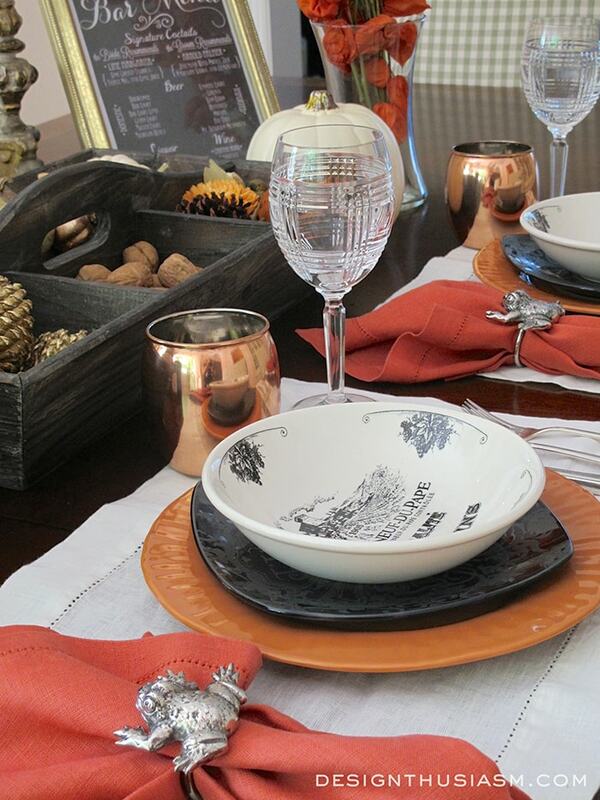 Linen placemats, vintage silver flatware and crystal goblets offer refinement. The silver candlesticks were found in a London antique market and the charcoal crystal bobeches were purchased in Mougins, France. I consider them beautiful, but here I think they convey a spooky edge. I love the frog napkin rings from Pottery Barn. I’ve used them in the spring for a nature theme, but here they communicate an appropriately creepy elegance. 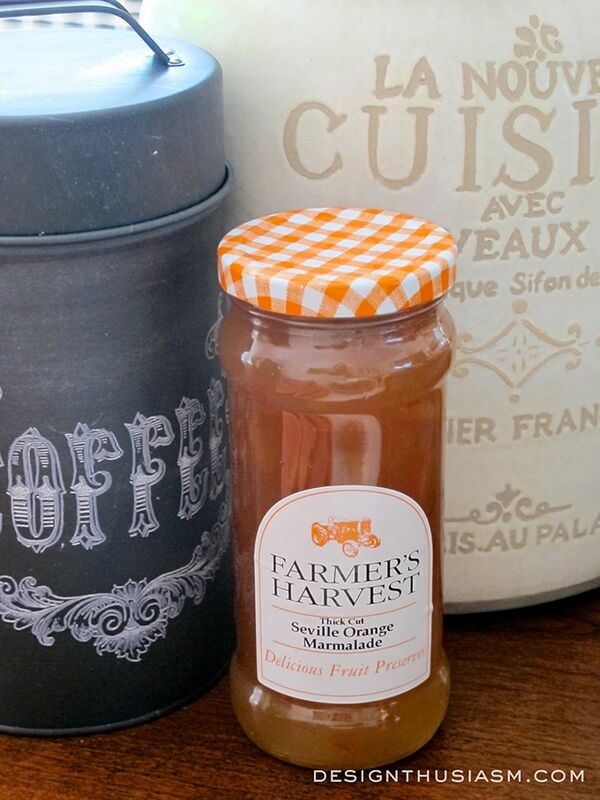 The French rustic jug and orange marmalade would look lovely on a breakfast table, but when combined with the black canister, they suddenly say Halloween. In the end, you don’t have to eliminate the conventional elements to put together a tasteful Halloween. You just need to start with a well defined design concept and build on that foundation organically. In this case, I started with black and orange and a French country sensibility, but stay tuned for my next foray, in which I’ll be using skulls and a posh outlook. Linking with Tablescape Thursday, From My Front Porch to Yours, Home and Garden Thursday, Feathered Nest Friday, Show and Tell Friday, Silver Pennies Sundays, Metamorphosis Monday, The Scoop, Inspire Me Tuesday, Twirl and Take a Bow, LittleRedBrickHouse SoMe2, Wow Us Wednesdays. Beautiful tablescape! What a lovely way that you have blended your dishes with the orange and black! Thanks Chloe! This one was definitely a fun challenge!! Lory, this is a perfectly elegant Halloween tablescape. You’ve incorporated the traditional colors beautifully! Ha ha… I SO hear you about the storage issue! Thanks for stopping by! 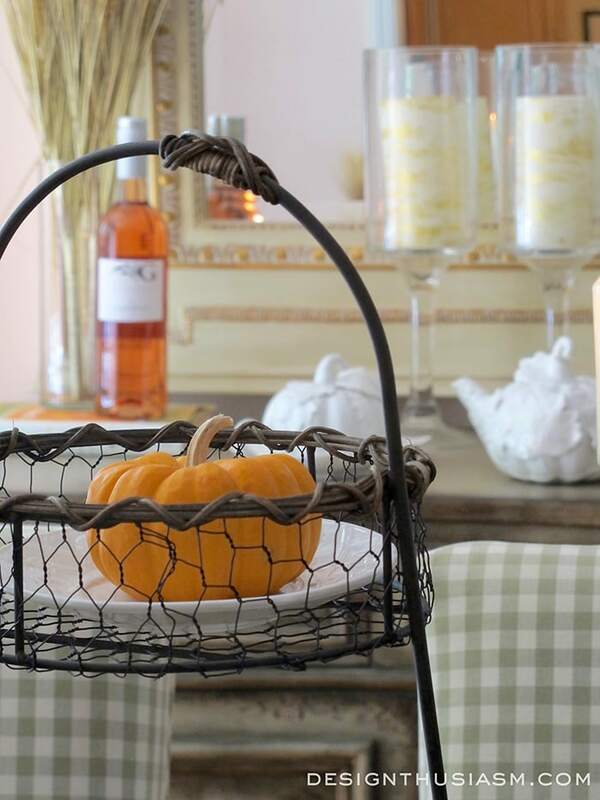 Loved seeing how you styled the chicken wire basket, white pumpkin ceramics and Staffordshire plates……I have them all. I wish i could put them together as well as you did – and that my Home Goods had more of the plates, I only snagged two. Very pretty and elegant. I don’t care for scary Halloween decor and this is a beautiful way to decorate for the season! Very well done! Thank you so much Katherine! Can you here me clapping Lory? 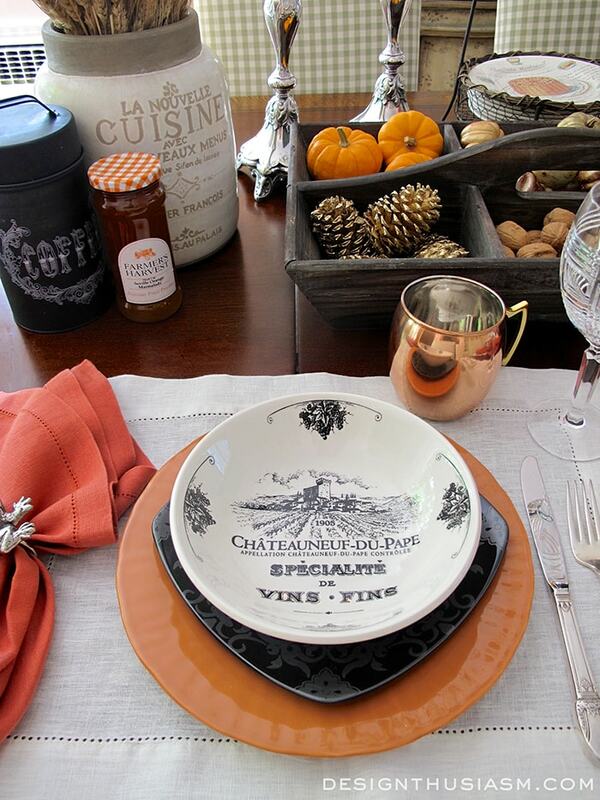 Bravo, I LOVE this, the french wine label bowls and the copper mugs and your chalk board bar menu, very elegant and the frogs are a subtle nod to the black and orange holiday! Ha ha… I thought I heard applause… 😉 Thanks Jenna!! I love tsat your table is seasonal without being overtly Halloween-y. I also love those pasta bowls. Do you happen to have a source for them? You are truly a woman after my own heart! I love this! Halloween doesn’t always necessarily need to include a lot of chintzy, gaudy stuff. It can take on an air of elegance with ease as you’ve demonstrated here. Little fun, subtle touches like the toad napkin rings are what makes this tablescape so cool. This gets my vote for sure!!! 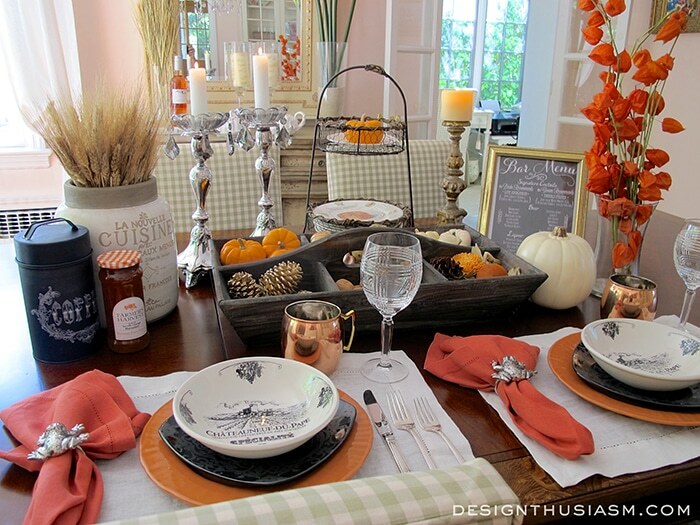 Love this Tablescape you put together. I’ve been crushing on those copper Moscow mule mugs. 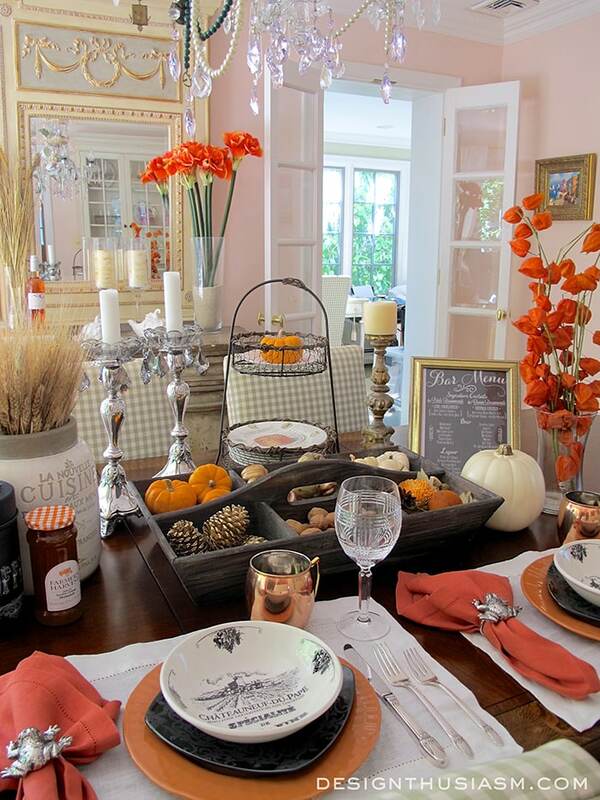 I adore this elegant Halloween Tablescape! 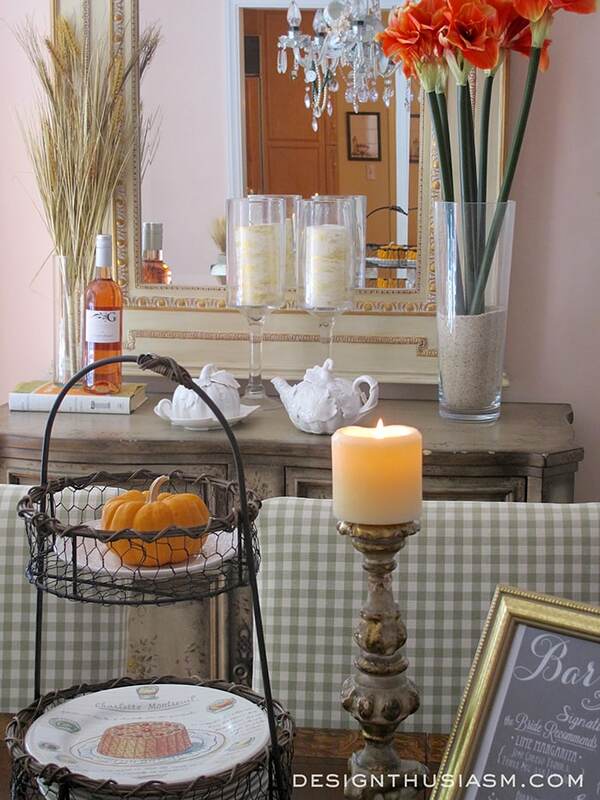 I prefer the sophisticated French elements that work together within a black, orange, and white color scheme. 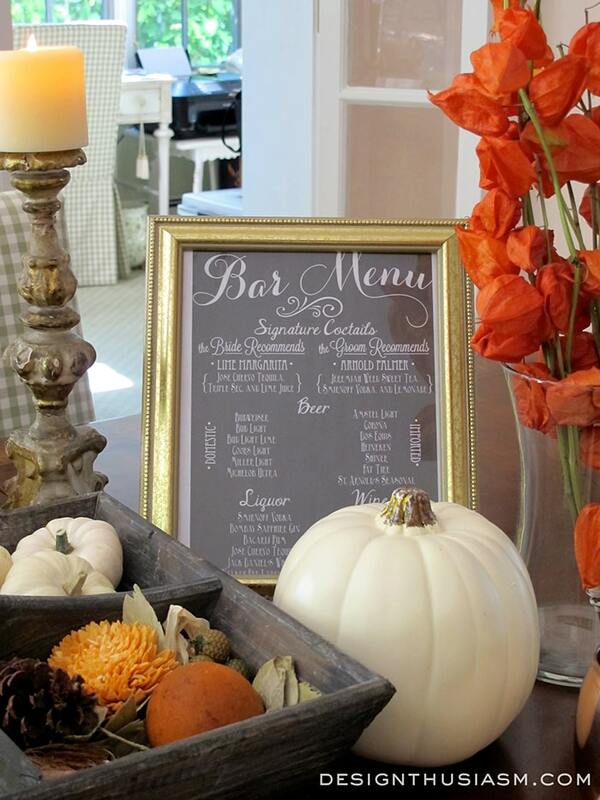 Gold pinecones and little pumpkins add the perfect touch. WONDERFUL! Beautiful scape Lory…love it!! Those dishes are wonderful too!…. This is beautiful, Lory. I love the dishes and the cups are just lovely. Beautifully done! I love how you created a classy tablescape for Halloween. It is one of the harder holidays to decorate for so I usually stick to a fall theme! Love it all here! Fabulous post! Love your gorgeous tablescape.